I’ll admit it….I have a bucket list of food. Some of it are fancy places I would like to go like The French Laundry or Jean Georges or WD-50. Some are simpler places like Snow’s BBQ in Texas or Katz Deli (I’ve never been to NYC) or Drago’s in NOLA for their grilled oysters (we missed it last time). Some of it’s just food that I want to try, not necessarily from any one place, like a real Philly cheese steak or lobster mac ‘n cheese or a Chicago deep dish pizza. Heck, I even have a folder of food saved on my computer of things I want to cook someday. Well, with Mrs. G out-of-town this week, I was able to cook somethin’ this past Friday that I know she would not be interested in, nor probably allow me to cook. Something I saw awhile back on TV, although I’m not sure who came up with the idea originally. 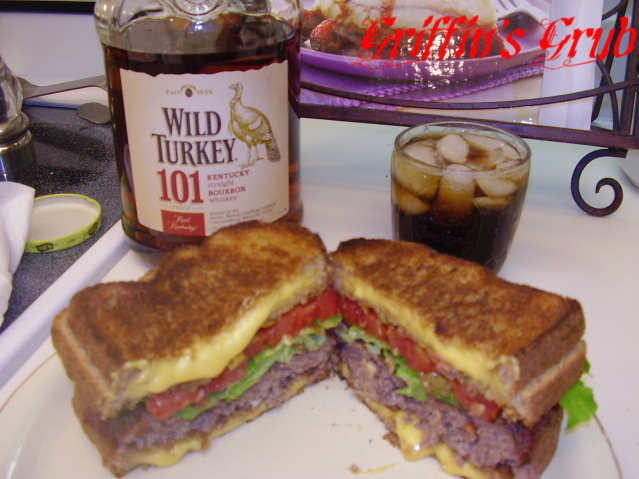 Something that I doubt I will ever cook again, but at least I can say I had one and cross it off my list…..a grilled cheese burger! 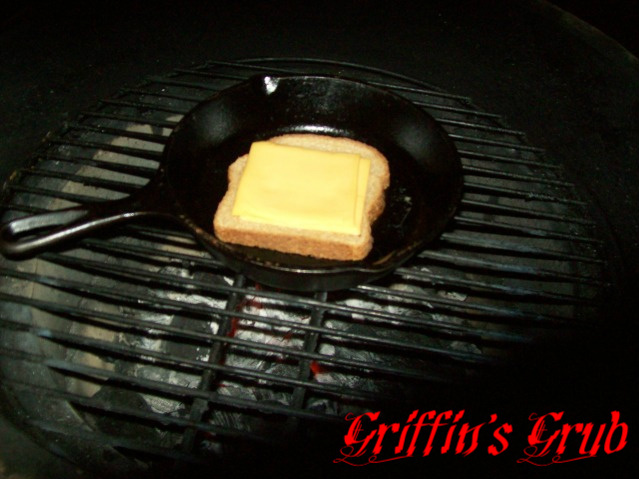 I don’t know about you, but growing up I could have lived on grilled cheese. And they weren’t any fancy kind of grilled cheese, just regular bread and plain ole American cheese. Loved ’em, couldn’t get enough of them. And what kid doesn’t like a burger? So it only makes sense to combine the two, right? I fired up my Egg, as I was going to be doing this all outside, and threw in a CI skillet to begin to pre-heat. Trying to plan ahead, I cooked one grilled cheese first, before throwing the burger on thinking the second grilled cheese would be done be done at the same time. This burger came from the batch of meat I ground up a few days before but had frozen for a later use. Starting to smell good and I was getting hungry by this point. Looks great, but yeah I’ve always thought that about the grilled cheese buns. Seems like it would be a little much. Griff that is a true thing of beauty. About brout a tear to my eye. That’a boy… Eat it now and apologize later. That’s what I would have had to do too! Looks delicious! I still want to make a burger with an egg on it like that one you did. 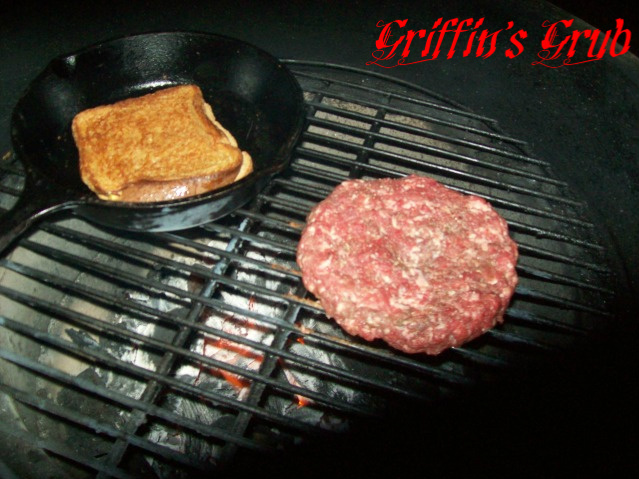 Now all you have to do is make one of those burgers that use a krispy kreme donut for the bun, lol. I saw this somewhere too and it just seemed like way too much bread, like you thought. I bet you were stuffed even with just half! I bow before your greatness. That is one tasty looking burger. Thank you, Sir! So if I can’t shop for a Valentine’s Day gift at a gas station, where should I go Oh Wise One? Lol. Wow, that is way over the top for me, but boy does it look yummy!!! My husband was out of town last night, so I made Mahi-Mahi with fresh pineapple and strawberry preserves. My husband would be SO on board for crossing this of his bucket list!! I do something similar I call the “Fatty Melt.” It’s like a patty melt, but the bun is two sanwiches, grilled, of melted Swiss cheese and sauteed onions. Kraut and Russian dressing go on the burger, lightly. But I found the key was, I had to make my own rye bread. If you started with a whole loaf, you could cut it into 1/4 – 5/16″ thick slices. If it’s too thick you can sprain your neck eating the burger. I’ve heard too many ways to get no sympathy from ER docs than to go there with a sprained neck from too thick a burger. Sounds like a great burger, Dr. Mike. I was showing my wife your blog and found this one. OMG your cholesterol is SKY ROCKETING. I am going to buy you a defibulator for Christmas and I dont even know you! Oh my gosh … this is heavenly! It was….just can’t make it too often.